This is a message to General Muhammadu Buhari from Mallam Nasir El-Rufai on the 4th of October, 2010 few months before the April 2011 elections. The attention of Mallam Nassir El-Rufai has been drawn to statements from Generals Muhammadu Buhari and Ibrahim Babangida purporting to be responses to the advice he gave both men to retire. Since, Babangida libelled whole generations of Nigerian youth as being unfit for leadership, age has become an issue in the coming elections. While it is true that neither youth nor age supplies wisdom on their own, it makes sense to ask those who have been recurring decimals in our country’s sorry history to leave the stage. That is all El-Rufai asked of these men who seem to think that their failure to do their best for Nigeria when they had the chance qualifies them for a return to office. Our people surely deserve better. El-Rufai is amazed that General Buhari cannot debate this matter without scurrying to the gutter, making claims that are baseless and unsupported by any facts. Mallam El-Rufai’s tenure as FCT minister was a period of stellar performance in remaking our federal capital. Despite the difficult decisions that had to be taken to restore Abuja, Mallam El-Rufai continues to receive deserved praise and recognition for his achievements in restoring the Abuja master plan, introducing Nigeria’s first computerised land registry and helping thousands of Nigerians achieve their dreams of home ownership in the federal capital. Buhari is perhaps one of a tiny few blinded by their prejudice from recognising the quality of El Rufai’s service. That same prejudice accounts for the baseless claims of corruption Buhari levels against El Rufai. The fact is that Mallam El-Rufai served Nigeria with integrity and has never been convicted of any corrupt act. He is boldly contesting the false charges which the Yar’Adua government filed against him in court. It is strange that a Buhari who protests when unproven claims of N2.5 billion (about US $3billion in those days!) missing oil funds are levelled against him can gleefully elevate similar claims into facts when it concerns another. How would Buhari feel if the corruption allegations made against him by Group Captain Usman Jibrin, then a board member of PTF, are today reported as if they were proven facts? So much for “corrupt background” and “shoddy performance”. Mallam El-Rufai wishes to remind General Buhari that he has remained perpetually unelectable because his record as military head of state, and afterwards, is a warning that many Nigerians have wisely heeded. His insensitivity to Nigeria’s diversity and his parochial focus are already well-known. In 1984, Buhari allowed 53 suitcases belonging to his ADC’s father to enter Nigeria unchecked at a time the country was exchanging old currency for new. Against all canons of legal decency, he used retroactive laws to execute three young men for drug-peddling after they were convicted by a military tribunal and not regular courts of law. Buhari was so high handed that he gave himself and his officials immunity even from truthful reporting. That obnoxious Decree 4, against which truth was no defence, was used to jail journalists and attempt to cow the media as a whole. That tyrannical legislation shows the essence of his intolerance. These are facts of recent history. The story of counter-trade and import licensing, the cornerstone of Buhari’s stone-age economic strategy and those whose interests it served, is a tale for another day. Mallam El-Rufai respects both Generals Buhari and Babangida as elder statesmen. He believes their age, experience and guidance may contribute to the success of any future government. El-Rufai however believes that it is time for a new generation of leaders with new thinking and wholesome democratic attitude to move our nation forward. The vicious response by the Buhari camp to a simple statement that their almost-70 principal should retire is proof enough that a Buhari, the new Democrat, tolerant of views different from his own, is yet to evolve. And that is sad, for his fledgling party and its leadership. Buhari and his cohorts may wish to reflect that it will take more than attacks on personalities to become electable. Having seen his version of discipline, Nigerians are not likely to cherish an encore. But they will welcome an engagement with the issues and problems of everyday life that have hobbled the peoples of this land. So what really has changed? Why does El Rufai now sing Buhari’s praise every now and then? This same El Rufai campaigned for late Umaru Musa Yar’Adua then later came to say ‘I didn’t endorse Yar’Adua’ is this man really trustworthy? I understand people are bound to change their minds but why is a double-tongued El Rufai different from the Abatis? Labaran Maku was a student activist, he forced subsidy down our throats. Abati was a great critic and brilliant writer, he’s now for the government he was against. So I think that should justify why El Rufai is also for Buhari now, things have changed, he now sees what he didn’t see initially. The same way Abati and Maku didn’t see it. Apparently, Mallam Nasir El Rufai isn’t corrupt (like Bankole, OGD, etc he’s not been convicted) but something is evident, he’s double tongued and insincere, can we trust this man? I hold no grudge against him, I only need him to defend this piece and prove to us why we should believe him this time and that he’s 100% endorsing Buhari. Well, an emotional piece. The writer was trying to draw lines and links between the Abati's and the Makun's of this world in government. Abolore, my friend, you opinion is seriously flawed. These men you have mentioned [Abati and Makun] are supposed to first show loyalty and respect for Nigeria which they serve first and foremost before their Pay-Master(s) since they are presently in Government. The truth is [and remains that] for these men to not call a 'spade a spade' simply means they have failed to up-hold integrity especially on issues such as The Fuel Subsidy Scandal, NYSC Wahala, Nigeria's state of finances [the country is BROKE] etc etc. In El-Rufia's case, he is singing the praise of an individual, a person, a civilian not in position of authority or bound to defend the people and constitution unlike the charlantans mentioned above. Your basis for/of comparison is flawed, therefore, wrong. A minister or a press secretary must not, in fact, should not lie or bend the truth to suit the President. [Remember the Watergate scandal or in more recent time, the Brown affair]. In conclusion [in my own opinion], I would still have prefered a Iron fist-ed Buhari government to the thief-ing inefficient hand of GEJ. …or which other leader [young or old] would you have prefered or have in mind? Buhari should just go and sit down and forget contesting because he can't win any election in this country. He's too parochial, a fundamentalist and has poor corruption and human right records. He's always quick to mention violence. Those are exactly what we don't need in Nigeria. 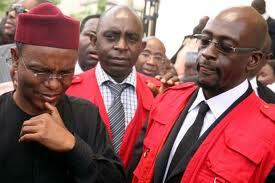 As for el-Rufai, I really don't trust him, he's too quick to paint himself as a saint and rubbish GEJ in particular. That is not to exonerate GEJ though. Fashola that should be a beacon of hope, a potential president, is now showing his tyrannical side. We need leaders in Nigeria.